Berta Engineering, National Consultants, Metaferia Engineering, Africa Consultants, Building Design Enterprises, Transportation Design Enterprises, Yerer Engineering, MH Consultants, Geomatrix Consultants, MIDROC Construction, etc. Link to Call for Papers - Here. Dr. Shiferraw Taye of AAU - Structures. Dr. Eyassu W/Senbet of LSU ME Dept. Ato Maaza Mekuria - Transp. Sys Eng. Dr. Messele Haile of AAU - Structures. Kemal Shemsu from Kyoto Univ. Prof. Riedmueller from Gratz Univ - Austria. 1. 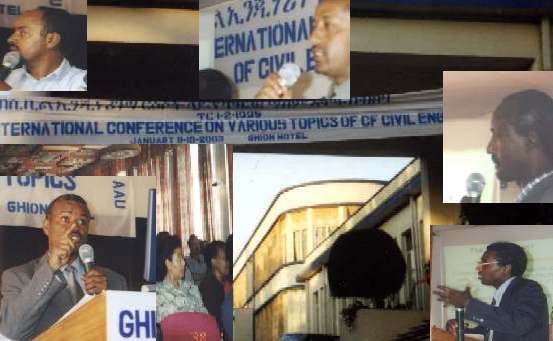 Dr. Asrat Worku, Associate Professor of Civil Engineering, Addis Ababa University, Ethiopia. 2. Dr. Samuel Kinde Kassegne, Visiting Faculty, Henri Samueli School of Engineering, University of California, Irvine.